As the 19th century came to a close, the American Southwest was undergoing enormous transition. Tourists from Europe and the East Coast of America flooded the area, drawn by word-of-mouth from early visitors and quick to take advantage of the railroad, which had just arrived in the West. One of the Southwest's major "attractions" was its vibrant Native American cultures. In response to unsystematic collecting by Eastern museums, anthropologist Edgar Lee Hewett founded the Museum of New Mexico in 1909 with a mission to collect and preserve Southwest Native American material culture. Several years later, in 1927, John D. Rockefeller founded the renowned Laboratory of Anthropology with a mission to study the Southwest's indigenous cultures. In 1947 the two institutions merged, bringing together the most inclusive and systematically acquired collection of New Mexican and Southwestern anthropological artifacts in the country. The Laboratory's collection continued to expand but was largely unavailable to the general public for lack of adequate exhibition facilities. 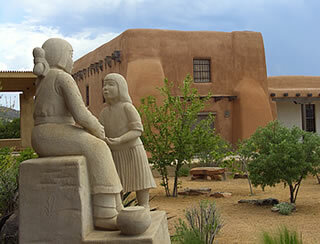 In 1977, the New Mexico legislature appropriated $2.7 million for the design of a new Museum of Indian Arts & Culture. The MIAC opened ten years later in 1987, immediately adjacent to the Laboratory, as the 31,000 square foot exhibition facility for the Lab's extensive collections. In the following years, planning began for additional exhibition and collections storage space in the 21,000 square foot Amy Rose Bloch Wing and the revolutionary new exhibition Here, Now & Always, which opened in August, 1997. This groundbreaking permanent exhibition, developed by a core curatorial team composed of Southwest Indian peoples and museum professionals, incorporates the voices of more than 75 Native Americans. Here, Now & Always tells the rich, complex and diverse stories of Native Americans in the Southwest through their own words and some 1,300 objects drawn from the Museum's collections. This expansion continues in the new Living Traditions Educational Center, a multifaceted education complex providing additional exhibition space, multi-purpose event center, a classroom, hands-on center, Docent Library, Resource Center, and Museum Studies Center.